After a windy afternoon and evening at Abraham Lake, our tour resumed early the next morning with a trip down to Kananaskis Country to shoot ice bubbles at sunrise on Sparks Lake. 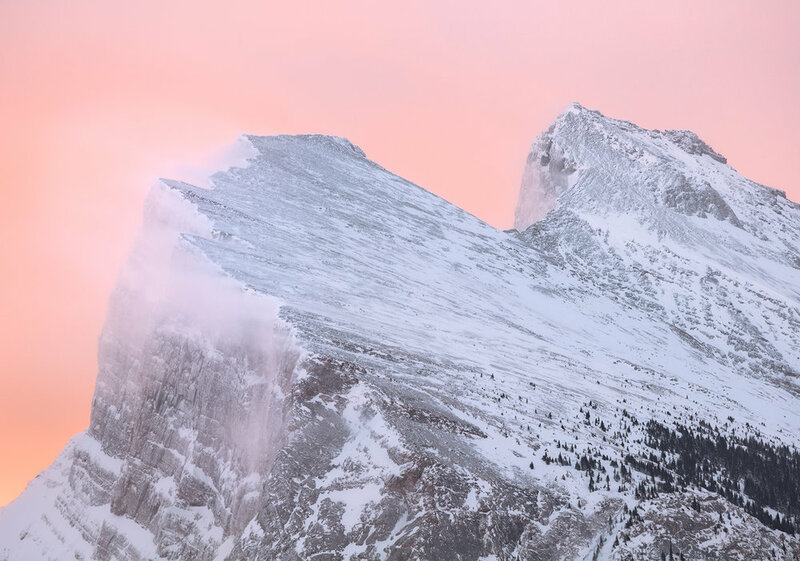 For many photographers, this type of experience makes the Canadian Rockies in winter a major attraction. But it's not as easy a task as it may seem. But using a tripod that close to the foreground ice is very difficult. I tried it but found it wasn't letting me get close enough. So as Marc urged, most of us abandoned the tripods and hand-held our cameras as we took successive shots. This is tough because you have to minimize movement between images or the eventual image blending in Photoshop won't work well. I'll be honest and say many of my images from this morning simply failed because I didn't get the full range of the scene in focus from front to back. But after a lot of "screen time" going through different images I found a series that worked well and, fortunately, included the sunrise near its peak color. That image, Morning Glory, is shown here. I really liked the different blue tones on each side of the ice crack, and this was easily the best sunrise of the trip. All in all, a rewarding morning with a bit of frustration at moments, but still a great experience. After some misadventures chasing a lenticular cloud for a few hours, we headed back down to Kananaskis Country in the late afternoon. This ultimately led to one of my favorite captures of the trip, and it was one of those wonderful, spontaneous moments when we rounded a bend in the road and dramatic scene was simply right there waiting. 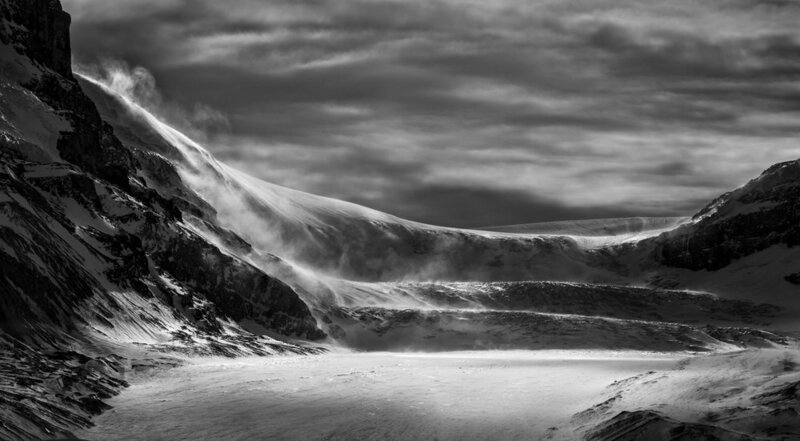 The image shown here is one of many that I shot of this ridgeline alive with blowing snow in the late afternoon light. I have a much wider panorama of the same scene that is composed of four shots stitched together in Photoshop to make one very large image. I ended up cutting it down some in the final edit to include only the most interesting parts of the overall scene. It really was a wonderful sight to see...the sidelit mountain and the powerful wind churning fresh snow into clouds hundreds of feet high (look at the trees to get a sense of scale). My current title, "Windswept," is hardly adequate to describe the scene. Our next day was, somewhat remarkably, unproductive for me at least. We had a forgettable sunrise and then struck out again in the afternoon, but as always the winter scenery of Banff and Jasper National Parks was enjoyable. The final full day of the trip began with an early morning adventure at Abraham Lake with a couple of other participants, David and Jack. The rest of the group stayed behind with Marc to work on Photoshop post-processing techniques, which Marc had reviewed with us the day before. We had a clear dawn and some good explorations along the frozen banks, with large blocks of ice forming small caverns here and there that were fun (if somewhat unproductive) to check out. We later reunited with the group to check out Tangle Creek, a well-known location just beneath dramatic Tangle Peak in Jasper National Park. A short time later, we stopped at the Athabasca Glacier viewpoint where sweeping winds carried snow particles down from the icefield. It's quite a sight, and we had it entirely to ourselves in the late afternoon. This image, Athabasca Glacier, is a blend of three images in Photoshop to create a panoramic view of the scene. The late afternoon light didn't offer a lot of color to work with in post-processing, and for my tastes a black and white conversion of the final image best conveyed the drama of the setting. We traveled back out to Abraham Lake for what proved to be the best sunset of the trip. It might seem like we spent a lot of time at Abraham Lake during the tour, but there are a number of nearby locations that we also visited and explored. Abraham Lake is also quite large, and you can spend days exploring different parts of its shoreline. In short, it deserves a few visits during a winter trip to the Banff/Jasper area, and at no time did I feel like we were continually treading the same ground in returning to the lake. Each visit was quite different and enjoyable. 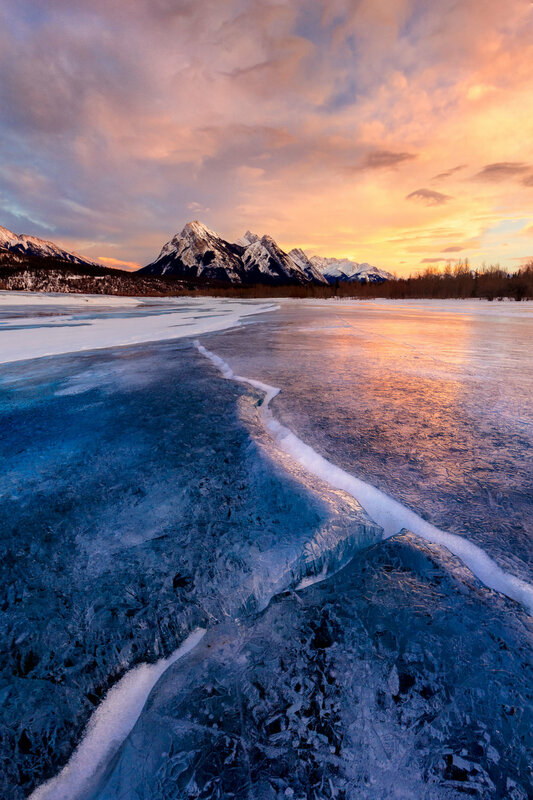 Abraham Lake is famous for its ice bubbles and other dramatic foregrounds, along with ceaseless winds. Nonetheless t is hardly easy to find "the right" foreground when the clock is ticking and you're competing with a handful of others. The image shown here is my best effort to pair a workable foreground with the peaking sunset light. The ice in the foreground is only 8-10 inches from the front of the lens. While I also captured a few other images this evening with ice cracks and textures that were maybe a bit more dramatic, only this series of a few images also included the nice reflective glow of the sunset light on the ice. We stayed out late, well after sunset, to capture some images of the stars above the mountains. Although we had a relatively warm trip in the Canadian Rockies (temperatures on this mid-February evening were probably in the low 30's or perhaps high 20's with little of the typical Abraham Lake wind), sitting on the ice for a couple hours eventually catches up with you. Without a doubt, the photo tour was a fantastic experience. We had some good luck with wind, blowing snow, and light at the ends of the day, and that more than made up for some of the "fails" that are part of any time spent photographing in a dynamic environment. I'm considering a further post with some reflections on the tour--what I really liked, what I would do differently in the field next time, and so on--in the future. But my hope is these two posts capture the experience well and tell at least a brief story about some of the images in my Galleries. Earlier this year, I spent five days in the Canadian Rockies on a photo tour led by professional landscape photographer Marc Adamus. It was truly a remarkable experience and produced a number of images that I'm very happy with. Here are a few of the highlights and a small sampling of my favorite images. Before meeting up with the group on February 10, I had the morning to myself in Banff. I considered a number of potential locations before settling on the most convenient--the Vermillion Lakes, which are practically in town but afford a great view of Mount Rundle. The image shown here is a familiar scene for most landscape photographers and anyone familiar with the area. While Mount Rundle is arguably the most photographed natural feature in the Canadian Rockies, I was still quite happy with Snow Streamers, Mount Rundle, as a start to the trip. The blowing snow and wonderful pastel light of dawn help compensate for the familiarity of the scene. Late in the morning, I met up with Marc Adamus and the group for lunch in Banff. Marc provided an orientation and outlined some objectives for the day and for the tour generally, including ideas for taking advantage of the warmer weather and high winds predicted for the Banff/Jasper area over the next few days. And sure enough, the high winds he mentioned would last through the week and produce blowing snow featured in a number of my favorite images from the trip. That afternoon we drove down into Kananaskis Country, a mountainous area in between Calgary and Banff. Our destination was Barrier Lake and vistas of Mount Baldy. It was a fantastic way to kick off the tour, with blowing snow churning across the ice at regular intervals through the late afternoon. (see Feel the Wind). And that was it for the day. With long driving distances between many destinations, it was usually impossible to shoot an afternoon in one location and then spend the evening in another. We generally stuck with 2-3 locations over the course of a day, from dawn to dusk (and sometimes later), and spent a not insignificant amount of time driving from place to place through the spectacular winter scenery of the Canadian Rockies. The following morning we drove out toward Abraham Lake and stopped at two destinations. One was simply a roadside area that featured a vista of a windstorm in a distant mountain range...definitely an occasion for a powerful zoom lens. The next was a flowing stream with expanses of frozen ice along its banks, including abundant icicles and deep powdery snow. Both locations produced some good images but none that quite make it into my "favorites" from the trip. Later on February 11, however, we explored the cliffs above Abraham Lake and a small section of the frozen lake itself. The high winds--and I mean knock you off your feet high--produced exceptional atmospherics that made for great images. One such image is Defying the Elements. Gusts of wind would kick up snow from storms a couple days earlier and create huge clouds of blowing snow. The small tree on the right-hand side of the image really caught my attention in exploring the area, and I like the balance it creates with the distant mountains in the late afternoon light. I'll save a description of the next few days for a separate post in the near future.